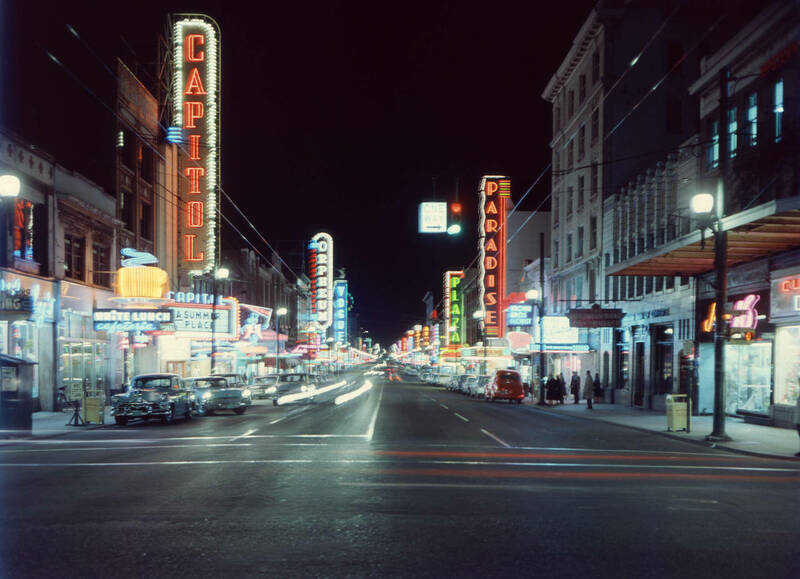 Granville Street, 1959. The speakeasies were a couple of blocks past theatre row. Fifty-four years ago this week, a big local news story was the proliferation of after hours clubs in Vancouver. In his Vancouver Sun “man-about-town” column, Jack Wasserman claimed that the “‘speaks’ are in full bloom all over town,” about 120 in total, and that the police were having a hard time shutting them down because the courts had raised evidence standards. The news wasn’t all bad, however. Wasserman pointed out that speakeasies satisfied a demand that once caused concerns about people drinking and dancing after hours at legit restaurants and cabarets. After hours clubs had a convivial club-like atmosphere, according to Wasserman, and offered shuffleboard, darts, pinball, and a juke box for dancing, and drink prices ranged from fifty to sixty-five cents, cheaper than their legal counterparts. The VPD’s Dry Squad added “a dash of excitement to the proceedings” that prevented the night from getting dull. Wasserman’s column created a bit of a furor at City Hall. Some aldermen took it as an attack on the police force while others demanded that the police report on the extent of the situation and what they were doing about it. Coincidentally, two speakeasies—1128 Granville Street and 1058 Seymour—were raided the next night. Forty-three people, including one juvenile girl, were arrested and charged with being inmates in a gaming house. The Sun’s Mac Reynold’s toured the booze cans the night of the raids, after a night at The Cave, where “the Martini’s cost $1.25, and the floor show wasn’t half as much fun.” The speakeasies felt more like home, “Home Sweet Home,” as Reynolds described them. Home Sweet Home. That, a friend and I found, is what they’ve gone and done to the bootleg joint. Mother is an ex-wrestler with a twitch. Sister is a call girl with legs that look ten feet long. The cradle is rocked to Bobby Darin singing Mack the Knife. But still, Home Sweet Home, where the guests drop in and brag about their Christmas cards and await the shaggy dawn. Reynolds found a similar ambiance at another after hours club in the West End. We saw a kitchen and, lo, a rumpus room. Couples fed coins into a vast chrome juke box. Dancers swirled on the parquet floor. The stagline mused from section lounges along turquoise panelled walls. And in the corner—under the caparisoned ceiling—a Christmas tree, dripping with tinsel and Yuletide cheer. More girls began to drift in. Lookers.